Home / Stock Picks / Dividend Stocks / Dow 23,000 Is Here. Should You Buy the DIA? Dow 23,000 Is Here. Should You Buy the DIA? Its point movements are constantly evaluated by the financial media, and its recent ascent above the 23,000 mark sent psychological ripples through the investing world. I’m talking, of course, about the Dow Jones Industrial Average. The Dow is the most famous and widely observed market index in the world. With the rise of exchange-traded funds (ETFs), it is now easier than ever to buy or short Dow Jones stocks, such as through the SPDR Dow Jones Industrial Average ETF (NYSEARCA:DIA). The broad answer is that it depends on what kind of portfolio you are constructing. If it is a long-term diversified portfolio, you will want to have some kind of domestic large-cap stock exposure. The Dow Jones stocks are nothing more than 30 large-cap stocks in a cap-weighted index. Sure, the Dow Jones stocks are companies you know very well and are legacy winners. Over the very long-term, such as rolling 30-year periods, companies in the Dow Jones have always had positive annualized returns. There’s a double-edged sword with this approach, and it mostly has to do with risk. You cannot only have securities within the Dow Jones in your portfolio. That’s not nearly enough diversification. Even though Dow Jones stocks have done exceptionally well over the past ten years, the average annual return, including reinvested dividends, is about 6%. We had the financial crisis in there, as you’ll recall. However, the standard deviation for the index was 14. That means that there is a 95% certainty that the Dow Jones stocks will return between -22% and 34% annually. Would you really sleep well at night with that kind of volatility in your portfolio? I doubt it. Which is why if you are going to buy the DIA, then you must offset it with assets that have far less risk. Volatility is risk; risk is volatility. That is the problem with almost every portfolio, as investors do not recognize the level of risk they carry. The Liberty Portfolio, my stock advisory newsletter, builds a long-term diversified portfolio designed to generate a real return that beats a weighted average of the markets with less risk. In the case of the Dow, you might think that buying fewer stocks would mean less diversification and therefore more risk. And yet the Dogs of the Dow strategy has yielded an average return of 8.6% since 2000, with roughly the same standard deviation. Go figure. 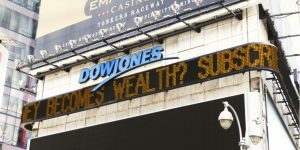 Now, there are other downsides to buying the Dow Jones stocks. At this particular moment, I consider the index to be vastly overvalued. It may be great that it has some wonderful companies in it, but it is not so wonderful that the wonderful companies are vastly overvalued. Even worse, there are several stocks like International Business Machines Corp. (NYSE:IBM) that have been languishing for years, don’t belong in the index, yet are still overvalued. There’s yet another problem with the Dow Jones stocks. Because the index is cap-weighted, if any given company gets hammered with some bad news, it could take down the entire index. The top-three Dow Jones stocks alone account for 21% of the entire asset base! It’s entirely possible that while other sectors of the market do extremely well in a given year, the Dow index declines because its top five stocks (which account for a third of the entire index) struggle. I would avoid purchasing the Dow Jones stocks as an index, or only do so as part of a very broad, very diversified, very long-term portfolio. Article printed from InvestorPlace Media, https://investorplace.com/2017/10/should-you-buy-the-dow-jones-index/.